The MS-80 multi-band saw is a precision device for cutting or slicing hard and brittle materials such as metals, ferrites, ceramics, stones, etc. In particular, the MS-80 multi-band saw is useful for cutting semiconducting materials. This multi-band saw enables cutting of very thin slices (a thickness of 50mm) with smooth cut surfaces. The MS-80 multi-band saw is recommended for cutting materials where loss of material should be minimized and cutting should not introduce crystal deformations or defects. Use of special accessories (goniometers, orientation devices, etc.) 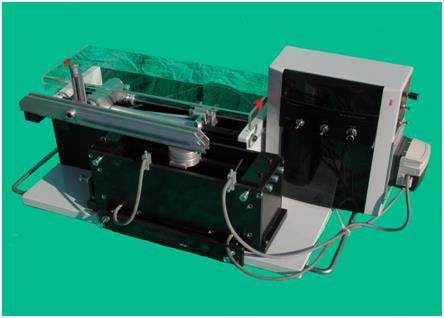 extends the MS-80 multi-band saw's application in precision cutting of crystallographically oriented crystals. The cutting operation of the MS-80 multi-band saw is performed by steel bands (blades) which are covered with an oil or glycerin-suspended carborundum (or boron carbide) abrasive slurry which is pumped into a closed loop. The sample moves back and forth in a reciprocating motion and is cut across in vertical planes by the cutting bands. These bands are tightened between two side walls of the tank. Special spacers make all tapes equidistant and enables cutting of several samples of the same thickness. It is possible to use different sized spacers to cut several dimensions of the samples at the same time. Our saws may be delivered with tensioned bands and set gaps.